WebFX is a leading voice search optimization agency that focuses on growing your business successfully with digital marketing. Whether you’re looking to increase your revenue, website traffic, or conversions, our award-winning team and voice search optimization services can help you reach your goals. In today’s online world, search engine optimization (SEO) is critical to online and offline businesses. Optimizing for voice search is also essential. Analysts predict that by 2020, voice searches will account for 50 percent of all searches. So, if you haven’t invested in voice search optimization, now is the time. Learn how voice search SEO can drive valuable traffic to your website, as well as increase your revenue, by contacting us online to chat with our award-winning strategists. Or, give us a ring at 888-610-5359 to start building a custom strategy! With sales from voice search expected to reach $40 billion by 2020 — they already surpassed $2 billion — investing in voice search optimization positions your company for success. At WebFX, we offer data-driven voice search optimization services that maximize your revenue. Ready to discover how our services can make a difference in your bottom line? Keep reading! A featured snippet is like a clipping from a newspaper or a magazine. It highlights specific information from an organic search result in a paragraph, list, or table format. The perk of featured snippets, however, is that they occupy Position Zero. Position Zero appears above the first and second search results, maximizing your visibility to users. Due to the high visibility offered by Position Zero, you want to earn the featured snippet for keywords relevant to your business and target audience. Even then, Google may not choose to use your website’s content. That’s why it’s helpful to partner with an SEO agency, like WebFX. We can review your website and develop a competitive strategy for earning Position Zero and its benefits. In this example, www.adoptapet.com is the third result. 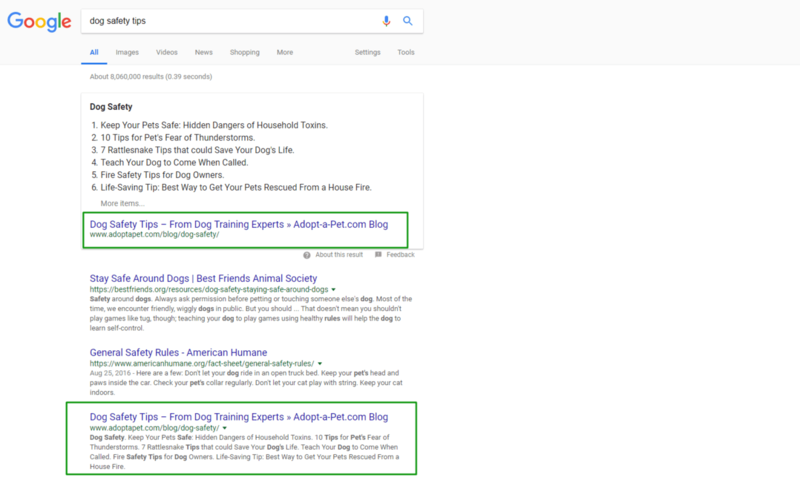 By earning the featured snippet, however, it also occupies Position Zero — that places it above the first and second results, giving it higher visibility to users. While Position Zero is a goal for standard SEO, it’s a must for voice search SEO. Why does Position Zero matter to voice search? Position Zero offers immense value to businesses. Why? If you earn Position Zero, you’ll take valuable traffic away from the first organic search result — on average, the first result’s click-through-rate (CTR) drops by eight percent when there is a featured snippet. When it comes to voice search, the value of Position Zero is unparalleled. Voice assistants — like Siri, Amazon Echo, and Google Assistant — use the featured snippet to respond to user searches. That means if you’re not in Position Zero, you’re not appearing to consumers that use voice search. With the predicted growth of voice search by 2022, it’s imperative to start voice search optimization for conversational search results now. If not, your business will start to lose valuable website traffic, leads, and revenue. What are conversational search results? A conversational search result is a result for conversational keywords or long-tail+ keywords. The “+” in long-tail+ keywords refers to the depth — or length — of these keywords. A long-tail+ keyword mimics how people talk, versus how they type. That is why voice search optimization is a challenge for companies, as it requires you to rethink your approach to search. Even the location of a user can influence how they use voice search. Due to these variances, it’s often overwhelming for businesses to do voice search SEO in-house. Partnering with our award-winning agency makes voice search optimization simple and hassle-free. With our passionate and hands-on team, we create custom and data-driven strategies that succeed. The result? The chance for your company to expand into new areas and even create new jobs. Why does voice search SEO matter to your business? With more than one billion voice searches happening each month, investing in voice search optimization is a smart choice. Whether you’re a brick-and-mortar store or ecommerce company, our voice search services offer ongoing value. In today’s online world, search is critical to growing your business. Eighty percent of consumers and 71 percent of companies make Google, Bing, and Yahoo their first stop when looking for a new product or service. That is why, if you want to reach your target audience, you need to prioritize search. Like local, standard, and ecommerce SEO services, voice search optimization focuses on improving your online visibility to search engines and users. What does online visibility even mean, though? When it comes to SEO, online visibility refers to your position in search results. If you’re a roofing company, for instance, you want to appear on the first page — in the number one position — of search results for keywords relevant to your business and target audience. For reference, keywords feature in user queries or searches. To demonstrate online visibility, consider the query, “steel roofing company.” Below, you can see that several roofing companies appear on the first page of search results, which is great because they provide metal roofing. Their visibility in search results offers an immense perk — they’re more likely to receive traffic from their target audience. In fact, the first position in search results receives more than 30 percent of all search traffic, emphasizing that if you’re not on page one, you’re missing out on valuable leads and revenue. Why does that matter to voice search, though? While voice search focuses on ranking in Position Zero, that position often requires that you rank on the first page of search results. A study by Ahrefs, for example, found that more than 70 percent of featured snippets come from the first three websites in search results. That is why our industry-leading team of digital marketers not only optimize your website to earn the featured snippet but to also rank on the first page of search results. This approach improves your online visibility in two ways. Once your website ranks in Position Zero, you can start increasing your online visibility to consumers that use voice search. That starts a ripple effect, leading to a series of benefits that your business can see in your day-to-day operations, from more product orders to more calls from potential clients. While long-tail+ keywords dominate voice search, so do featured snippets. In the same study, Ahrefs discovered that more than 50 percent of featured snippets appear for long-tail keywords — not short-tail keywords. That means there is plenty of opportunity for voice search to drive traffic to your website. Depending on your industry, you may also have a wide variety of long-tail+ keywords that our team can optimize your website for, giving you more chances to reach your target audience. If your featured snippet answers a user’s question, however, will they visit your website? It’s a great question. While some users won’t visit your website, others will click on your featured snippet to learn more about a topic, service, or product — depending on their voice-enabled device. In most cases, these are the users in your target audience. They have an interest in learning not only about the types of roofs available but also the costs associated with those roofs. Once a user arrives on your website, you can also work to keep them on your site through content marketing. This digital marketing service focuses on creating original, high-value content for users. It can include top of the funnel, as well as bottom of the funnel content that guides consumers to conversion. The best part is that content marketing can support voice search optimization. For example, if our team develops an infographic about roofs, we can optimize it for voice search — and for more than one long-tail+ keyword. In turn, your website earns several featured snippets with a single piece of content. By ranking for Position Zero across several keywords, your business then maximizes its traffic potential. With almost 80 percent of Americans owning smartphones, it’s becoming more common for users to search while on-the-go. For local businesses, this trend has immense value. Local searches, which often happen on mobile devices, convert 80 percent of the time. In this scenario, the benefit of your voice search optimization is that Google Assistant, Siri, or Amazon Echo reference your company when a user asks about a restaurant, pool, or hardware store near them — in this scenario, assistants would pull-up your Google My Business listing. That can result in not only a visit to your store but also a purchase. What if you’re an ecommerce company or a business without a storefront, though? Our voice search optimization services can still help you increase your conversion rates. If you’re looking to build your subscriber list for email marketing, for instance, earning the featured snippets in search results can lead to a conversion. For example, your guide on roofing could include a call-to-action (CTA) that invites users to become a part of your email subscriber list. Based on the quality of the content, it’s likely that many readers would sign-up to receive more content. In this scenario, your email marketing, content marketing, and voice search optimization work together. That kind of integrated digital marketing strategy is valuable. It’s also why businesses often partner with full-service Internet marketing agencies, like WebFX. With our range of services, as well as a team of more than 200 experts, we can provide your company with personalized, performance-driven digital marketing. Whether your conversion is a sale at your store or a sign-up for your email newsletter, voice search optimization creates revenue. In some instances, it coordinates with your other digital marketing services to accomplish that. For example, it can generate a new lead via an email newsletter sign-up. Your email marketing strategy can then guide that user to the bottom of your buying funnel, leading to a sale — if you’re unfamiliar with email marketing, it offers a massive return on investment (ROI) of $44 for every $1 invested. When it comes to our digital marketing services, from voice search SEO to email marketing, it’s critical to our team that you receive a return. It’s how we measure our success, and so far, we’ve tracked more than $1 billion in revenue for our clients. That’s why you can trust our team and your hands-on account manager to develop a voice search optimization strategy that drives results. With voice search, you can also build your brand awareness. Better brand awareness among your target audience can lead to several other benefits, like more conversions and more revenue for your business. How does voice search optimization help brand awareness, though? Consumers that use voice search on their smartphone see the featured snippet provided by their voice assistant, like Siri or Google Assistant. That featured snippet includes specific information about your company, like your website URL. In most cases, your URL includes your business name. As users continue to conduct voice searches around a topic, such as roofing, your website will probably continue to pop-up in their voice searches. That signals that your business is a trusted resource for all-things roof related. As their brand awareness grows, they’ll come to trust — and later choose — your company for their purchase needs. As your partner, our team utilizes the best technology and strategies to optimize your website for voice search. Get a preview of how we deliver our voice optimization services below or contact us online or by phone at 888-601-5359 to chat with our award-winning strategists about a personalized strategy! Researching keywords is a core part of our voice search SEO services. It’s essential that our team uncovers the keywords that your target audience uses. That way, we can build a competitive strategy for voice search optimization. We also analyze the user intent behind a keyword. While a keyword may relate to your industry, it may not capture your target audience. For example, someone in your industry may ask a voice assistant to find a “roofing materials calculator,” but it’s not something your audience of homeowners would ask. For the best results from our keyword research efforts, we use several industry-leading tools — including MarketingCloudFX. This is our proprietary application that features IBM Watson, a powerful artificial intelligence (AI) software. As we develop and implement your voice search optimizations strategy, MarketingCloudFX can provide insight into our keyword choices, as well as recommendations for future keywords to target. That gives your business a competitive strategy that challenges your competition. Next, we move on to creating content — up to 400 words — for your voice search strategy. How do we develop content for our business? We consider a few factors, including your industry, target audience, and goals. Our copywriting team, which has experience in technical and non-technical industries, then writes the content. Before forwarding the copy for your team to review, we check its readability on the Flesch-Kincaid scale. We follow the industry’s standard for an eighth-grade reading level. We then provide the copy for you to review. If you have feedback, our team implements it right away. As a part of our voice search optimization searches, we optimize your webpages for search engines and users. On-page optimization includes several different tasks, such as optimizing your images and headings for search engines and users. For example, if we created a frequently asked questions (FAQ) resource for roofing, we would optimize each of the headings as questions. These headings would target each of the long-tail+ keywords we wanted to target. By optimizing these headings, as well as creating optimized content, we would earn the featured snippet for each heading’s designated keyword. As a result, users in your target audience would see your website when using voice search, leading to all the benefits of voice search SEO. Optimizing your website for voice search is an ongoing strategy. If you make voice search a one-time investment, it won’t take long for a competitor to steal your featured snippet. That is why our team routinely tests and improves your featured snippet. Our proactive approach ensures your business remains the primary contact for voice searchers in your target audience. It also helps continue the benefits of voice search optimization, such as brand awareness and website traffic. Those benefits lead to even bigger gains, like more revenue for your business. With more profits, your company can start working towards larger goals, like expanding into a new area, creating a new position, or donating to a local charity in your area. Why choose WebFX for voice search optimization services? For decades, businesses across the globe have trusted WebFX for their digital marketing needs. With a team that consists of the industry’s leading experts and the most powerful AI software available, we are the leading performance-driven agency for mid-sized businesses. More than 20 years of experience: With more than two decades of experience, WebFX knows SEO. That doesn’t mean we stop learning, though. Our team’s active in the industry and remains up-to-date on the latest changes to create innovative strategies for our clients. More than four dozen industry awards: Our passion for digital marketing shows in not only our client testimonials but also our trophy cabinet. We’ve received more than four dozen awards for our work in web design, SEO, and more. More than $1 billion driven in revenue for clients: With our industry-leading ROI software, MarketingCloudFX, we’ve tracked more than $1 billion in revenue for our clients. That’s allowed our clients to create new jobs, support their local communities, and more. A few other reasons why businesses choose WebFX? Advanced tech: The most powerful AI software is IBM Watson — and it powers MarketingCloudFX, our proprietary and exclusive software for WebFX clients. With this kind of revolutionary technology, you receive innovative and actionable insights. The result is a game-changing digital marketing strategy. Unparalleled satisfaction: We do more than provide our clients with performance-driven strategies. We also offer them a level of service that’s personal and dedicated to their goals. That is why our client retention rate is more than 90 percent — and why our client recommendation score is almost 500 percent higher than the industry’s average. Data-driven strategies: As an agency driven by performance, we focus on creating customized data-driven strategies for your business. With MarketingCloudFX, plus our team’s dedication to learning your business, we can develop a digital marketing plan that reaches your company’s biggest goals. Ready to partner with WebFX for your voice search SEO? If you’re looking for voice search optimization services that drive real results, trust WebFX. With more than 20 years of experience and hundreds of satisfied clients, you can count on our passionate team to help your business reach its most ambitious goals. Contact us online today to get started — or, give us a ring at 888-601-5359 to get a free custom quote! What Is Voice Search? Tips for Earning Featured Snippets How Web Design and SEO Are Related What Is Speakable Schema Markup?